Long before the house at 319 R Street NW (below) was built between 1902 and 1903 by Harry Wardman and designed by Nicholas R. Grimm, an older brick house occupied the exact same location. It was constructed before the requirement of a building permit, which was necessitated by the City of Washington beginning in February of 1877. Utilizing a combination of maps, tax assessments, geneology and deed research, however, it has been determined that the house had been built about 1850. Located outside the city at the time, it had no address, but eventually became known as 317 R Street. It was built and owned by George Glorious, as was the entire Square 519. As one can see on the 1887 Hopkins Map, illustrated above, Glorious operated a large scale greenhouse where he grew flowers for resale. Early listings for his business reveal that it was located at what was then known as 316 Boundary Street (Florida Avenue today), with retail locations at 1112 7th Street, NW and at stall number 247 at the Center Market (right). It was located where the National Archives building stands today on Constitution Avenue, NW. According to the 1870 census, which was taken at 317 R Street, George had been born in Prussia (Germany) in November of 1821. He moved to Washington, DC in 1846 and shortly thereafter, established his floral business. His wife Mary had been born in Bavaria (Germany) in April of 1824. Together, they had five children that included Mary (born 1852), Andrew (born 1854), George Jr. (born 1856), Barbara (born 181858), and Ignatius (born 1865). Glorious indicated that his real estate was then valued at $70,000, a tremendous sum at the time. His personal property was then valued at $500. Both sons Andrew and George indicated that they worked in the family business as gardeners. The Glorious business was included in an 1884 publication titled Historical and Commercial Sketches of Washington and Environs, seen at left. 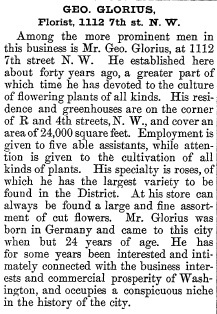 Glorious had established the business about the same time he came to Washington, DC, about 1846 at the age of 24. His specialty was roses, but apparently conveyed all varieties of cut flowers and plants. 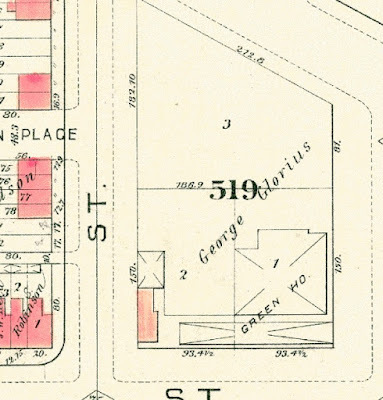 The 1880 census taken at 317 R Street revealed that all the children remained at the house that year, all unmarried, and most of whom worked for the family business. Son George was married and had his own son named George by 1884. Eleven years later, the Washington Post reported that the young boy had been seriously injured when he fell off an awning pole at the house on August 15, 1895. The 1900 census taken at 317 R Street lists only George, Mary, and their daughter residing at the house. 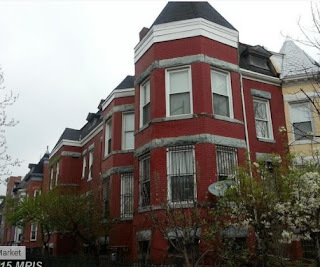 However, the family stayed close by – daughter-in-law Elizabeth and her two children resided at 320 Florida Avenue, and son George resided with his wife Anna and their five children at 316 Florida Avenue, NW. With the city rapidly developing and expanding, the George Glorious decided to sell Square 519 to developer Harry Wardman. 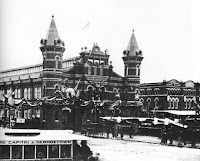 The sale was announced in the November 1, 1902 edition of the Evening Star newspaper who reported it as “Glorious Square.” The sale price was $35,500. Glorious, however, wisely negotiated Wardman building a house for himself on the location of his former home, now known as 319 R Street, NW, where the family remained for many years. Other houses in the development were also built for members of the second generation of Glorious family members. 319 R Street, NW (right) is currently being renovated (2018). Building permits in Washington were not required until 1872, and not archived until 1877. Permit No. 1 was issued to Martin McMalty on February 17, 1877 for a $50 repair to his house on H Street on Capitol Hill. The first house issued a building permit occurred on the same day, when Thomas Henry was awarded Permit No. 2 for his $15,000 house to be built at 916 6th Street, NW.